Another important advance is in our knowledge of the part Cellulose-bacteria. played by bacteria in the circulation of carbon in nature. 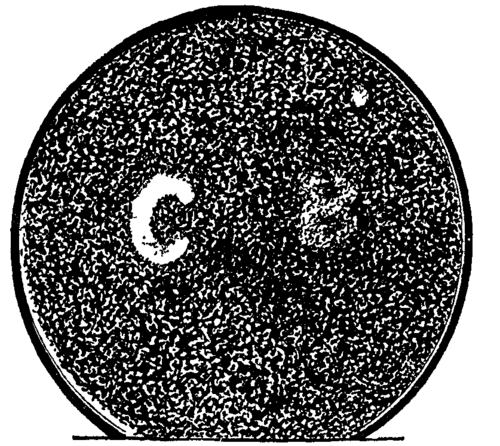 The enormous masses of cellulose deposited annually on the earth's surface are, as we know, principally the result of chlorophyll action on the carbon dioxide of the atmosphere decomposed by energy derived from the sun; and although we know little as yet concerning the magnitude of other processes of carbon-assimilation - e.g. by nitrifying bacteria - it is probably comparatively small. Such cellulose is gradually reconverted into water and carbon dioxide, but for some time nothing positive was known as to the agents which thus break up the paper, rags, straw, leaves and wood, etc., accumulating in cesspools, forests, marshes and elsewhere in such abundance. The work of van Tieghem, van Senus, Fribes, Omeliansky and others has now shown that while certain anaerobic bacteria decompose the substance of the middle lamella - chiefly pectin compounds - and thus bring about the isolation of the cellulose fibres when, for instance, flax is steeped or "retted," they are unable to attack the cellulose itself. There exist in the mud of marshes, rivers and cloacae, etc., however, other anaerobic bacteria which decompose cellulose, probably hydrolysing it first and then splitting the products into carbon dioxide and marsh gas. When calcium sulphate is present, the nascent methane induces the formation of calcium carbonate, sulphuretted hydrogen and water. We have thus an explanation of the occurrence of marsh gas and sulphuretted hydrogen in bogs, and it is highly probable that the existence of these gases in the intestines of herbivorous animals is due to similar putrefactive changes in the undigested cellulose remains. Cohn long ago showed that certain glistening particles observed Sulphur bacteria. in the cells of Beggiatoa consist of sulphur, and Winogradsky and Beyerinck have shown that a whole series of sulphur bacteria of the genera Thiothrix, Chromatium, Spirillum, Monas, etc., exist, and play important parts in the circulation of this element in nature, e.g. in marshes, estuaries, sulphur springs, etc. When cellulose bacteria set free marsh gas, the nascent gas reduces sulphates - e.g. gypsum - with liberation of SH, and it is found that the sulphur bacteria thrive under such conditions by oxidizing the SH and storing the sulphur in their own protoplasm. If the SH runs short they oxidize the sulphur again to sulphuric acid, which combines with any calcium carbonate present and forms sulphate again. Similarly nascent methane may reduce iron salts, and the black mud in which these bacteria often occur owes its colour to the FeS formed. Beyerinck and Jegunow have shown that some partially anaerobic sulphur bacteria can only exist in strata at a certain depth below the level of quiet waters where SH is being set free below by the bacterial decompositions of vegetable mud and rises to meet the atmospheric oxygen coming down from above, and that this zone of physiological activity rises and falls with the variations of partial pressure of the gases due to the rate of evolution of the SH. In the deeper parts of this zone the bacteria absorb the SH, and, as they rise, oxidize it and store up the sulphur; then ascending into planes more highly oxygenated, oxidize the sulphur to SO. These bacteria therefore employ SH as their respiratory substance, much as higher plants employ carbohydrates - instead of liberating energy as heat by the respiratory combustion of sugars, they do it by oxidizing hydrogen sulphide. Beyerinck has shown that Spirillum desulphuricans, a definite anaerobic form, attacks and reduces sulphates, thus undoing the work of the sulphur bacteria as certain de-nitrifying bacteria reverse the operations of nitro-bacteria. Here again, therefore, we have sulphur, taken into the higher plants as sulphates, built up into proteids, decomposed by putrefactive bacteria and yielding SH which the sulphur bacteria oxidize, the resulting sulphur is then again oxidized to SO and again combined with calcium to gypsum, the cycle being thus complete. 2FeCO + 3OH + O = Fe(OH) + 2CO. The ferric hydroxide accumulates in the sheath, and gradually passes into the more insoluble ferric oxide. These actions are of extreme importance in nature, as their continuation results in the enormous deposits of bog-iron ore, ochre, and - since Molisch has shown that the iron can be replaced by manganese in some bacteria - of manganese ores. Considerable advances in our knowledge of the various chromogenic Pigment bacteria. bacteria have been made by the studies of Beyerinck, Lankester, Engelmann, Ewart and others, and have assumed exceptional importance owing to the discovery that Bacteriopurpurin - the red colouring matter contained in certain sulphur bacteria - absorbs certain rays of solar energy, and enables the organism to utilize the energy for its own life-purposes. Engelmann showed, for instance, that these red-purple bacteria collect in the ultra-red, and to a less extent in the orange and green, in bands which agree with the absorption spectrum of the extracted colouring matter. Not only so, but the evident parallelism between this absorption of light and that by the chlorophyll of green plants, is completed by the demonstration that oxygen is set free by these bacteria - i.e. by means of radiant energy trapped by their colour-screens the living cells are in both cases enabled to do work, such as the reduction of highly oxidized compounds.